There was no denying the moment. Phil Dawson could feel the difference as he paced backwards to line up the 33-yard field goal attempt. Longsnapper Kyle Nelson and punter/holder Bradley Pinion were unusually quiet. Focus was essential amid wet conditions at Levi’s® Stadium, and neither player wanted to be the one responsible for keeping Dawson away from the looming milestone. Dawson drilled it between the uprights. The kick put the San Francisco 49ers on the scoreboard against the New England Patriots, but more importantly, it marked Dawson’s 400th career field goal. The 18-year veteran became the 10th kicker in NFL history to reach the mark. What’s more, Dawson owns the best career field goal percentage of any kicker to make 400 (84.7 percent). That’s a remarkable number given the 14 years Dawson spent in Cleveland’s unpredictable winter conditions. And it’s what Dawson continues to do. The 41-year-old has made 14-of-15 field-goal attempts this season and is showing no signs of slowing down (as evidenced by his booming 53-yard field goal against the Arizona Cardinals in Week 10). Dawson't teammates mobbed him back on the sideline. Everyone took the opportunity to shake his hand and congratulate their esteemed teammate best known in the locker room as, “Uncle Phil.” Dawson has learned to love the nickname first given by Torrey Smith. But it’s better than “Grandpa Phil,” right? 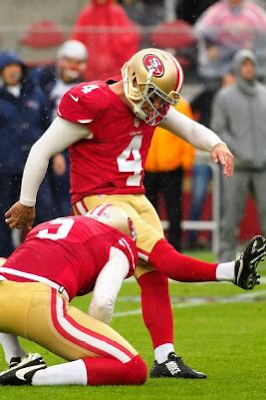 The 49ers kicker couldn’t have timed his momentous achievement any better. Each year, the kicker’s wife and three kids come to a home game around Thanksgiving. This meant that no special travel plans were needed to be made for the Week 12 contest against the Patriots. In addition, Dawson’s parents alternate Thanksgiving and Christmas with his in-laws. This year, it was Dawson’s parents who got to be in town for the turkey day trip. As for the ball, it still resides in the equipment room at 49ers HQ. It will eventually assume it’s proper place on the mantle at Dawson’s home in Austin, Texas. Marshal Yanda devised the solution himself. If there was no way to get his injured left shoulder up to snuff for the remaining seven games of the 2016 season, the Ravens guard would find a way to rely more heavily on his right shoulder. Perhaps if he fired from the left side of the line instead of the right, he'd be able to use his healthier wing to smash interior defenders. Yanda, a five-time Pro Bowl selection at right guard, suggested the shift to Ravens coach John Harbaugh at the beginning of last week. By Sunday, he looked ready to start the Pro Bowl at his new spot. So what if he hadn't played a single snap at left guard in 10 pro seasons? So what if his bad shoulder would torment him through two more months of NFL combat? The move provided a perfect mini-synopsis of Yanda's understatedly brilliant career — a blend of will, resourcefulness and rare athletic ability. "If guys wouldn't look up to Marshal, I don't know who they would look up to just in terms of the total package," Harbaugh said. "The ability to do what he did, the willingness to do it and then to be able to pull it off, it's pretty remarkable." Yanda has now served as a model of professionalism for an entire generation of Ravens offensive linemen. "As soon as I came here, I knew one of the guys I'd be looking up to was Marshal," said left tackle Ronnie Stanley, the team's No. 1 draft pick. "He's everything I expected him to be and more. Great teammate, great leader, really understands the game without taking it too seriously. If coaches are doing something he doesn't think is useful to players, he'll say something. He's kind of a players' leader. He's always fighting for us, and out on the field, he's always fighting." 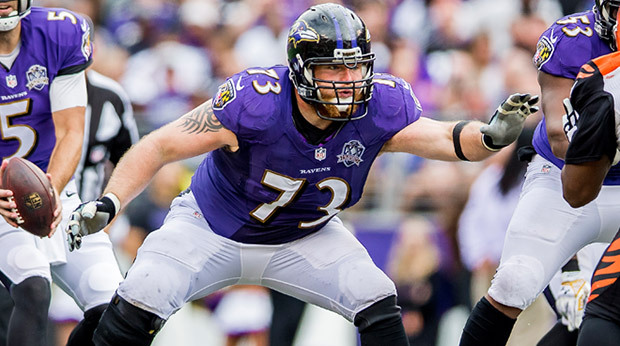 Yanda hurt his shoulder sometime during the Ravens' Week 5 loss to the Washington Redskins. The stoic All-Pro didn't come out of the game, so many were surprised when he appeared on the team's injury report the following week. He missed three of the next four games, fueling concerns that his shoulder might be wrecked enough to cost him the rest of the season. Leave it to Yanda, however, to find a way to keep playing. He did not merely grit his way through a so-so performance. He graded as the best guard in the league, according to the scouting web site Pro Football Focus. He was flawless in pass protection, a major reason why quarterback Joe Flacco took just three hits all game. And he was the key blocker on the Ravens' first scoring drive, which featured runs of 20, 16 and 18 yards. After running back Terrance West powered across the goal line, Yanda sprinted to meet him in the end zone, where he wrapped West in a vigorous hug. The last thing he looked like was a guy with a busted shoulder. Of course, we've seen this before. 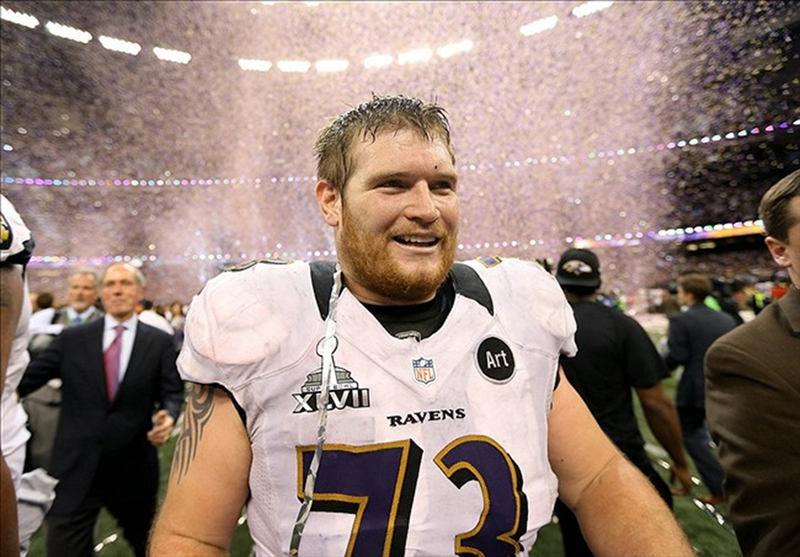 Yanda played with a torn rotator cuff during the team's run to Super Bowl XLVII, postponing surgery until five days after the Ravens beat the San Francisco 49ers. As a rookie, he famously took two jolts from a stun gun to win a $600 bet. Easiest money he'd ever made, the Iowa farm boy declared. Yanda, 32, has accepted pain as an inherent part of the job ever since he blew out his knee five games into his second season. "You have to understand, it's not if you're going to get hurt. It's when," he said in 2014. It's an outlook he shares with linebacker Terrell Suggs, one of only two players who have been on the Ravens longer than Yanda. "That's kind of the mentality, for some of us," said Suggs, who's playing with a torn biceps. "It's the cost of doing business. That's the only way Marshal knows to play. We all be getting banged up, and Marshal's going to be out there. It's good to see your bell cow out there, definitely." Yanda has never been the most talkative Raven, and he politely declined an interview request Wednesday. But his teammates are happy to fill in the blanks on one of the most respected players in the locker room. "I asked him when was the last time he was on the left side, and I forget what he told me, but it wasn't any time close to now," Flacco said. "So it's definitely impressive what he does, week in and week out. He recalled Yanda was "pretty down" a few weeks ago when his season appeared in jeopardy. But when Flacco showed up for work last week, he noticed "an extra pep" in Yanda's step. "Then he broke it to me he was going to try to play the left side," Flacco said. "Obviously, I love that." 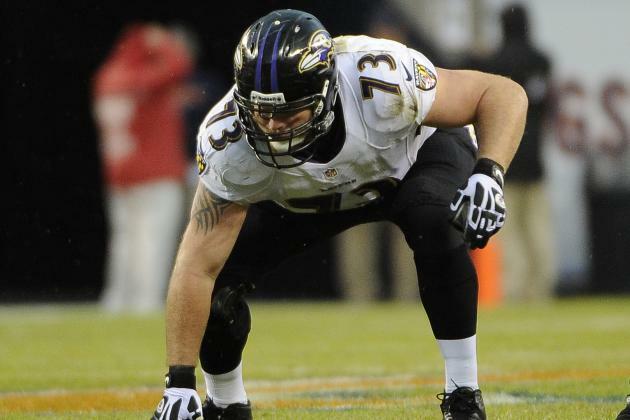 Harbaugh is no longer surprised by Yanda's adaptability. He has shifted him to tackle several times over the years to cover for injuries to other players. But the right-to-left flip revealed another layer of versatility. "I don't know if it's quite as drastic as this, but in some ways, it's like you're a lefty all of those years, and now, you have to go over to the right of the plate and hit," Harbaugh said. "You have your other hand down. You have your other foot back and everything is backwards; you're setting to the left instead of to the right. All the plays are flipped. I think for him to do it … I was weary of it early in the week. I was just watching him in individual and seeing how he moved, but he did look natural doing it. … It just shows you what a phenomenal athlete he is and how determined he is and really what a good football player he is." Stanley made the switch from right tackle to left tackle over an entire offseason in college and said it's no small thing to reset your muscle memory. "That's the hardest part, is just getting your body parts to react the same way," Stanley said. 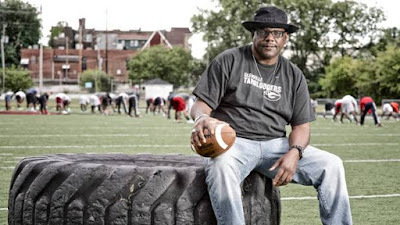 "Offensive line isn't a normal body position for humans to be in, so to alter that after you've been practicing your legs to move a certain way for so long, it doesn't just come naturally. It's definitely a big feat." Stanley was mighty impressed with the way Yanda carried it off against the Dallas Cowboys. "But for Marshal," he said, "it's probably just normal." 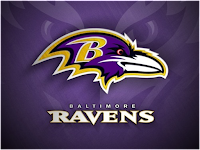 The Baltimore Ravens offense ranks 25th in points scored per game. They rank 18th in passing yards per game and 28th in rushing yards per game. Needless to say the offense has been disappointing. Despite these very unappealing numbers, the purple and black are 6-5 and due to the head to head tie breaker with the Pittsburgh Steelers, are in first place in the AFC North. The Baltimore offense has been awful. When you compare the results of the Ravens offense to the results of their opponents, you see how good the defense is. The offense has gained 209 first downs compared to their opponents 183. Joe Flacco and company have gained almost 4,000 yards more than the Ravens opponents have this season. Justin Tucker has gone 27-27 on field goal attempts this season. 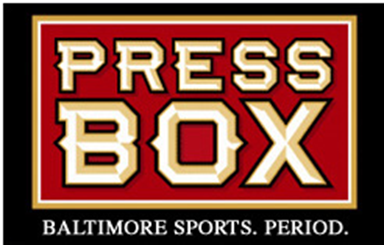 Baltimore’s opponents have only tried 14 field goals this season and only scored on nine of them. While opponents have combined for six more touchdowns than the Ravens offense, that just shows you how impaired the purple and black are when it comes to scoring. Baltimore’s defense is allowing just 18.3 points per game, which is the fourth best in the NFL. Dean Pees’s defense ranks in the top 10 in almost every statistical category. The overwhelming conclusion to all of this is simple. The defense is so good, that it is carrying the entire team. Every week the defense is asked to do it all. The defense knows going into the game that they can’t win in a shootout. The purple and black have to get big time results from the defense to even have a chance of winning. Baltimore has won six games and it is the defense that deserves the most credit. A 2016 Ravens game has a very familiar pattern. The defense gets off to a strong start. The defense keeps the team in the game while the offense wastes their potential. Eventually the dam breaks and the defense gives up a big play or two. It’s hard to win when the defense has to dramatically out perform the offense just to stay in the game. If Baltimore wins the AFC North with this stagnant of an offense, the defense deserves a ton of credit. Dean Pees is now calling the defense from the sideline and it is making a huge difference. Now Pees can communicate with the players better. This may explain why he seems to fix things and adjust better in the game. Lardarius Webb and Eric Weddle have strengthened the back end of the defense. This has given Pees the freedom to mix of pressures and coverage schemes. The Baltimore defense may be the most impressive unit in all of football. There are few teams that have asked their defense to do more for them. The defense has been put in bad spot after bad spot and Terrell Suggs and company don’t blink. What could the Ravens do if the offense got their act together? 1. Bucs LB Lavonte David. The upstart Buccaneers suddenly have a winning record, and Lavonte David’s performance Sunday is a big reason. David was so good on Sunday that his 93.9 overall grade was the highest of any player at any position in Week 12. In coverage, David allowed only one catch for three yards, and his 96.5 coverage grade ranked first among all defensive players in Week 12. Russell Wilson’s QB rating when throwing into David’s coverage was 56.3, and David also harassed Wilson with one hit and one hurry on nine pass-rush snaps. 2. Saints TE Josh Hill. Hill might not be the first Saints tight end who comes to mind, but his blocks were the key to some of New Orleans’ bigger runs in the demolition of the Rams’ defense. Hill’s run-blocking grade of 88.8 ranked second among all offensive players in Week 12. 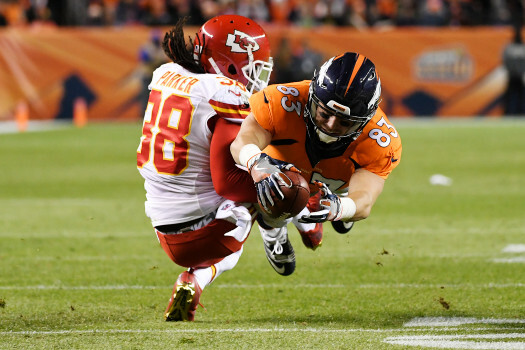 Hill was also a productive in the pass game, with six receptions on six targets and 51 yards after the catch. Drew Brees’s QB rating when throwing at Hill was 118.1. 3. Lions OT Riley Reiff. Matthew Stafford gave thanks for Reiff on Thursday. 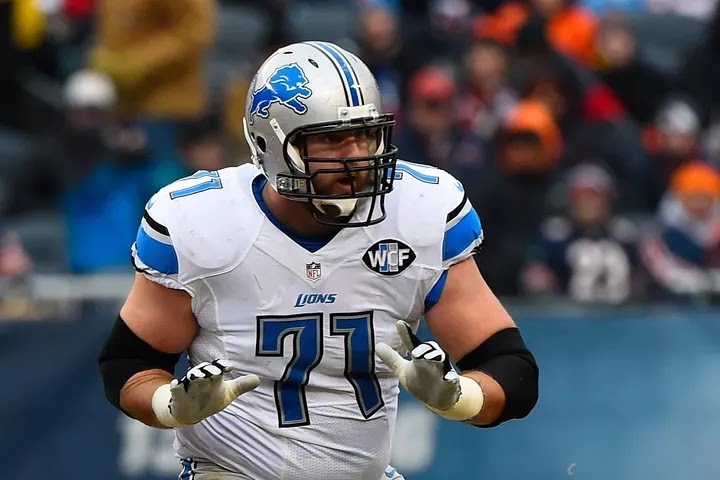 Reiff didn’t allow a single sack, hit or hurry of Matthew Stafford on 45 pass-blocking snaps, and Reiff’s 86.6 pass block grade ranked second among all tackles in Week 12. Reiff was also a solid contributor to the run game as well, with a 73.6 run-block grade in a big NFC North divisional win. The Bengals sixth round pick from the 2013 NFL Draft is finally getting a chance to show his worth. And, he played a great game on Sunday in Baltimore, proving to the Bengals he deserves more touches. When Giovani Bernard went down with a torn ACL in the Bengals’ Week 11 loss to the Bills, it signaled an opportunity for Rex Burkhead to finally get his shot at proving his worth in the NFL. Burkhead got just that in Week 12 as he played 38 snaps in the Bengals' loss to the Ravens, which is actually one snap more than starter Jeremy Hill played in the game. That he did. Burkhead was the Bengals' leading rusher with 29 yards on five attempts (a 5.8 yard per carry average), including a long of 17 yards. 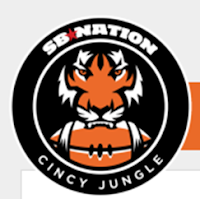 It's a pretty sad state of affairs when the Bengals' leading rusher notches only 29 yards. Burkhead added to his total yardage on the afternoon with two catches for 19 yards. Coincidentally, he also had a 17 yard catch. 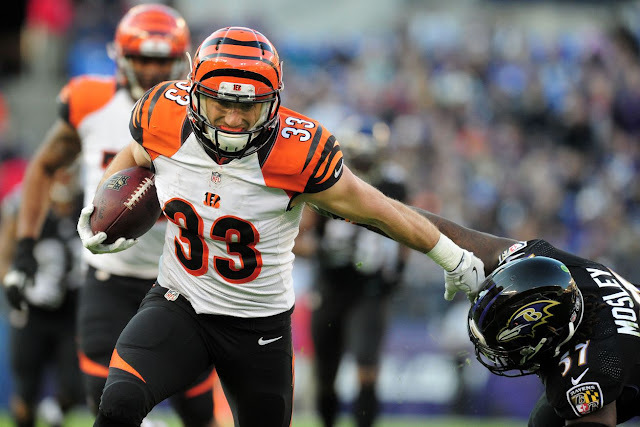 The Bengals were slow to put their trust in Burkhead as he only carried the ball five times, and they will need to —and should— trust him more in the weeks ahead. Jeremy Hill had 12 rushes for 21 yards on Sunday, (a 1.75 yard per carry average), with the Bengals inexplicably running the ball only 17 total times (not including Andy Dalton's three running plays). Even against a tough defense like the Ravens’, the Bengals typically don’t succeed when they abandon the run game. In the fourth quarter, Burkhead did the bulk of his damage, getting his hands on the ball five times, including three consecutive run plays where he accumulated 28 yards and netted the Bengals first downs on two of the three plays. Prior to Sunday’s loss to the Ravens, Burkhead had 70 career rushing yards, 167 receiving yards, 1 rushing touchdown and 1 receiving touchdown. He has mostly made an impact on special teams during his time in Cincinnati, including being used as a return man this year. On six kickoff attempts this season, Burkhead has accumulated 114 yards including a long of 26 yards (averaging 19 yards per attempt). His impact is sure to increase in the five games ahead on offense. And, for Burkhead, it’s good timing as he’s set to become a free agent in March 2017. “I haven’t had that many opportunities in my career, so finally I got some chances, and it felt good. I got into the rhythm. I was comfortable in the run game. I just went out there and tried to do my best,” Burkhead said. Prior to last season, there was significant hype surrounding Burkhead and the impact he could make as a pass catcher. But, the Bengals have hardly utilized the player who many have referred to as an X-factor. Burkhead sounds like his has the right attitude and all the motivation necessary to try and steal some wins in the Bengals’ final games of the season. Burkhead figures to be a big part of that fight for the rest of the season. Freshman Ted Ginn Jr.'s 82-yard punt return highlighted the Buckeyes' 37-21 victory in 2004. Punter Adam Finley was the last line of defense. Before the once-beatens, Ohio State and Michigan, play ''Survivor'' for a potential berth in the College Football Playoff at high noon today in The Horseshoe, the Big Ten Network is airing a documentary about the unbeatens in The Game of 2006. Ten years ago, No. 1 Ohio State outgunned No. 2 Michigan, 42-39, on the day after the great Michigan coach Bo Schembechler died. This spurred thoughts of the best Ohio State games I've covered since I began writing columns on Ohio State in 1984. I'm skipping the losses — the Desmond Howard Heisman pose in 1991; Stan Jackson's pick-six thrown while the ground was rushing up at him, rather than take a sack in 1997; the ''Shawn Springs Slipped'' game in 1996. They would all be on a list of Michigan fans' favorites. As for Buckeye fans, their list would skew to the Jim Tressel/Urban Meyer era, although Earle Bruce's valedictory makes my list, too. 2006: Ohio State-Michigan 2006 was a great event, marking the zenith of the Big Ten's reputation in this century. Only now, with three teams in the Associated Press top five (No. 2 Ohio State, No. 3 Michigan, No. 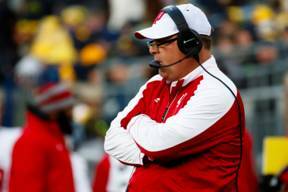 5 Wisconsin) has the Big Ten come close to the 1 vs. 2 frenzy in 2006. Ohio State was in command most of the game. A late Michigan touchdown and two-point conversion made it closer than it seemed. Unfortunately, it was followed by serious routs of both teams in bowl games. Southern California bounced Michigan in the Rose Bowl, 32-18, and OSU fans got an early, terrifying glimpse of Urban Meyer when his Florida team humbled Ohio State in Arizona in the BCS Championship Game, 41-14. 2005: I have to put the 2005 game high on the list. It was a 25-21 Ohio State comeback win in Ann Arbor, led by Wolverine nemesis and former Glenville standout Troy Smith. OSU rallied from a ninepoint deficit in the last seven minutes. Unforgettable highlight: ''The Catch'' on the winning drive by St. Ignatius' Anthony Gonzalez. 2004: Everyone saw what was coming, both good and bad, the previous year in a 37-21 Buckeyes upset of a Michigan team that had already clinched the Big Ten championship. The good: In his first Michigan game, Smith ran for 145 yards, passed for 241, threw for two TDs and ran for one. The play of the game, for all that, was still the 82-yard dazzler of a touchdown punt return by Glenville's Ted Ginn Jr. The bad: On fourth and 1 at the Michigan 29, future Cleveland Browns receiver Braylon Edwards, foreshadowing much of his Browns career, ran a 1-yard turnout, designed to get the first down and step out of bounds late in the game. The pass was right in the breadbasket as OSU played soft, just trying to keep everything in front of the defense. Edwards dropped it. 1987: An emotional No. 1 might be this game, Earle Bruce's last after he was fired in the week leading up to The Game for winning ''only'' three of every four games in his OSU career. Ohio State had lost three straight games going into The Game and trailed, 13-0, in the first half. A comeback does not happen in such circumstances after the week the Buckeyes had, but it did. It was as memorable for Bruce's ride off the field on the shoulders of his players, all of whom were wearing headbands lettered ''Earle,'' as for the 23-20 victory in a rousing second-half rally. 2001: I also have to include the 2001 edition, a 26-20 Ohio State victory in Jim Tressel's first try against the previously dominant Wolverines. Michigan's Marquise Walker dropped the would-be winning touchdown pass deep in the end zone right between the uprights late in the game. But the bigger story was Tressel got a look at what a quarterback named Craig Krenzel could do. The biggest story might have been that Tressel ''called his shot,'' all but promising a victory in Ann Arbor on the day he was hired. 2013: More exciting to me even than the fabled 2006 meeting was Ohio State's 42-41 victory in 2013 over an inspired Michigan team that went only 7-6, but emptied the playbook that day. The Wolverines burned OSU all afternoon with throwback screens. Included in the wild game was a near-brawl between players, with quarterback Braxton Miller's participation somehow missed by referees, the ejection of Marcus Hall, the ''Birdman of Glenville'' and the game-saving interception by Bedford's Tyvis Powell on a two-point conversion pass by Michigan QB Devin Gardner. The latter foreshadowed Glenville linebacker Chris Worley's similar play to save Saturday's 17-16 victory at Michigan State. The Ravens Pro Bowler came up with the idea to move across the offensive line for his first start at left guard since high school. The move helps him be stronger and protect the injury to his left shoulder. Add this to Marshal Yanda’s tome of tough stories. With concern that the Ravens’ five-time Pro Bowl right guard could miss the rest of the season because of an injury to his left shoulder, Yanda came up with the idea to flip sides on the offensive line. Left arm’s hurting? Let’s try the right one. Yanda started at left guard for the first time in his 10-year career in Sunday’s 27-17 loss in Dallas, and could stay there for the rest of the season. He hadn’t played left guard since high school. It’s a major development for an offense that has been hampered by a shuffling line this season. “He felt like it would be better with his situation, with his shoulder to be on the other side, that it would give him the best chance to be strong and stay healthy,” Head Coach John Harbaugh said. In 2011, Yanda played in a game just days after having emergency leg surgery. He played through a torn rotator cuff in 2013. There are probably countless other injuries he’s played through without the media or public knowing. This year, Yanda has been dealing with a left shoulder injury suffered on Oct. 9 when he moved to right tackle to help out when Rick Wagner went down. Yanda missed the next two games (Week 6 vs. the New York Giants, Week 7 vs. the New York Jets), then came back to face the archrival Pittsburgh Steelers after the bye. He wasn’t well enough to face the Cleveland Browns four days later. Just the fact that Yanda missed three games speaks to the severity of the injury. He had missed just two games over the previous seven seasons. Yanda didn’t just prove his grit by taking the field. He played at a high level too. According to Pro Football Focus, Yanda was still the Ravens’ best offensive player against the Dallas Cowboys with a plus-4.0 grade. Running back Terrance West ran behind Yanda for an 18-yard touchdown in the first quarter. 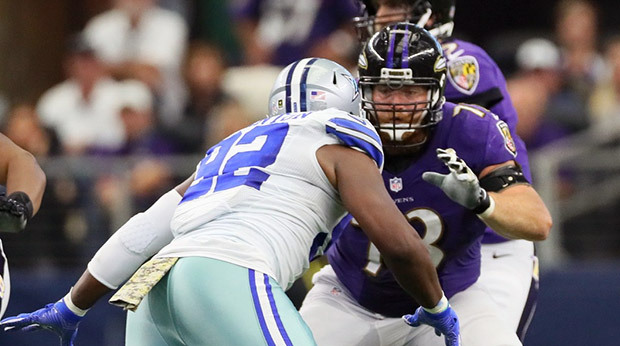 Yanda fired off the snap, turned and walled off Cowboys defensive tackle Terrell McClain. Harbaugh said he was wary of the move early in the week, and he kept a close eye on the offensive linemen’s individual drills to see how Yanda would adapt. Yanda looked natural, he said. But just how hard is that transition? “I don’t know if it’s quite as drastic as this, but in some ways it’s like you’re a lefty all those years, now you’ve got to go over to the right side of the plate,” Harbaugh said, dropping a baseball reference. At right guard, his inside arm would be with his injured left shoulder. So he would have the most trouble stopping an interior rush, and getting push up inside that way. At left guard, Yanda can rely more on his right shoulder and arm coming off the snap. The good news is Yanda came out of the game healthy and told Harbaugh on Monday that he felt strong. Yanda even got in a weightlifting session Monday morning. OWINGS MILLS, Md. -- Marshal Yanda was the Ravens' media Most Valuable Player last year due to his omnipresence and efficiency at right guard. But what has made the five-time Pro Bowl pick one of the best players in team history is that he has displayed the same qualities up and down the offensive line. In 2010, when supplemental draft pick Jared Gaither incurred a training camp back injury, Yanda quietly and selflessly moved to right tackle and stayed there for 16 regular-season games and two postseason contests. After returning to right guard the following year, he was called upon to move back to tackle for a key November game against Pittsburgh, and he again distinguished himself as the Ravens converted 14-of-21 third-down plays and won a key road game. In the 2014 season finale, with Rick Wagner out with a foot injury, Yanda again put the team before himself and helped the Ravens beat Cleveland, 20-10, to clinch a playoff berth. And on Nov. 20 in Dallas, Yanda put into motion his own plan to switch to left guard, protecting his injured left shoulder on which he sports a harness. Yanda played all 52 offensive snaps and paced an offense that posted a season-high 7.1 yards per play during a 27-17 loss to the streaking Cowboys. The performance from the 2007 third-round pick was a big talking point for head coach John Harbaugh as his 5-5 team battles inconsistency heading into the season's second half, which begins with the first of two games against AFC North rival Cincinnati Nov. 27. "He got out of it really well," Harbaugh said. "In some ways, it's sort of like, you're [a] left-handed [hitter], and now you're on the other side of the plate. "You're placing your other hand down and you've got your other foot back. ... You're setting for the left side instead of the right. All the plays are flipped. I was wary of it early in the week." 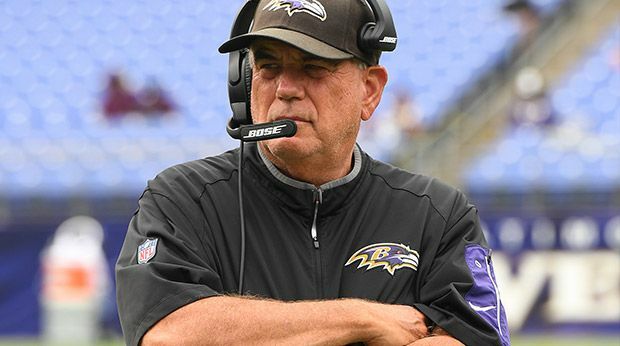 With a mediocre record, the bigger picture for Harbaugh is trying to capture another AFC North crown, which would be his third and the team's fifth. One saving grace to the Ravens' spotty performance so far this year is the fact they are 3-0 against division foes. But that comes with two caveats: the division is noticeably down this year, and two of the wins were against the winless Cleveland Browns. "We look at this as a six-game season," Harbaugh said. "And, in some ways, this is like our opener. ... We know everything is right in front of us. This is an opportunity to win the division." The way this year's schedule was laid out, all three of the Ravens' AFC North home games were slated for November. Two of them are already out of the way, with Baltimore having beaten Pittsburgh and Cleveland in a five-day span earlier this month. But an intriguing game awaits with Cincinnati, a team struggling at 3-6-1 and sucker-punched with injuries to standout receiver A.J. Green (strained hamstring) and running back Giovani Bernard (ACL tear). Neither is likely to play against the Ravens. Green has been a particular challenge, having posted 41 career catches and six touchdowns during eight games against Baltimore, averaging 17.7 yards per reception, more than any other opposing receiver in team history. For perspective, the Jacksonville Jaguars' Jimmy Smith averaged 15.8 yards per catch in 15 games against Baltimore from 1996-2005 and Pittsburgh's Hines Ward posted a 12.2-yard rate in 26 games against the Ravens from 1998-2011. Green is a major reason why the Bengals have won five straight and six of the last seven games against the Ravens; the lifetime series between the teams is tied (20-20). "If we don't start beating the Bengals, we're not going to win any division championships," Harbaugh said. "That's especially true this year." However, the situations aren't as clear regarding two key Ravens, linebacker Elvis Dumervil (foot), who has played in just two games this year, and cornerback Jimmy Smith (back). Harbaugh said he will leave it up to team doctors to see if they return. Tight end Nick Boyle's 10-game suspension is up, and he will return to the practice field this week, but there is no clear determination on whether he will play against Cincinnati. Tackle James Hurst has been used as a third tight end the past two weeks. The last time Ravens guard Marshal Yanda had played prior to Sunday’s game against the Dallas Cowboys, he re-aggravated a left shoulder injury that forced him to sit out his third of four games. But Yanda avoided another setback after playing all 55 snaps on offense in an eventual 27-17 loss at AT&T Stadium in Arlington, Texas. Coach John Harbaugh said Yanda felt good enough to work out at the team’s training facility in Owings Mills on Monday. A five-time Pro Bowler at right guard, Yanda approached the coaching staff about starting at left guard, where the team has lost rookie Alex Lewis to a high ankle sprain for at least another four weeks. Harbaugh said Yanda looked like a natural on the left side between rookie left tackle Ronnie Stanley and center Jeremy Zuttah, while Vladimir Ducasse made his second consecutive start at right guard. While Yanda solidified the offensive line, there isn’t much clarity regarding the availability of cornerback Jimmy Smith and outside linebacker Elvis Dumervil for Sunday’s pivotal AFC North showdown with the visiting Cincinnati Bengals at M&T Bank Stadium. Smith missed his first game of the season due to a back ailment that flared up last week. Dumervil is still dealing with a foot injury related to surgery he underwent in the offseason. SANTA CLARA, Calif. -- For a team that hasn't had much to celebrate during a nine-game losing streak, the San Francisco 49ers at least have kicker Phil Dawson to serve as the one consistent positive they can count on from week to week. Dawson's latest accomplishment was mostly lost in the shuffle of the Niners' 30-17 loss to the New England Patriots on Sunday, but it was no less impressive despite the lack of attention. With a 33-yard field goal in the first quarter, Dawson became just the 10th kicker in NFL history to convert 400 field goals in his career. Out of that club, which includes the likes of Morten Andersen, Gary Anderson and Adam Vinatieri, Dawson has the highest field goal percentage at 84.7. In typical Dawson fashion, he downplayed the accomplishment because the Niners came up short on the scoreboard. After Dawson's field goal sailed through the uprights, long-snapper Kyle Nelsonbee-lined for the end zone to secure the ball as a souvenir for his kicker. Dawson also received a warm welcome and congratulations from the majority of the Niners coaches and players. Beyond the field goal achievement, Dawson finished with five points in Sunday's game, becoming the 10th player in team history to score 400 or more points with the franchise. 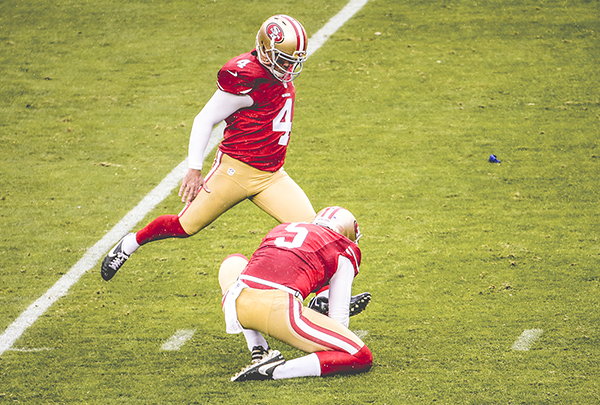 He's the third-fastest kicker in 49ers history to reach that 400-point mark, doing it in just 58 games. Dawson has drawn plaudits from coach Chip Kelly for his extensive study of wind patterns and conditions at all of the NFL stadiums. Sunday's game might have brought some of the most difficult he's faced since joining the 49ers as heavy rains hit Levi's Stadium. It didn't seem to bother Dawson much. Rooney Award: Three members of the 2015 AP All-Pro team — Browns tackle Joe Thomas, Ravens guard Marshal Yanda and Seahawks kick returner Tyler Lockett — are among the 32 finalists for the NFL's Art Rooney Award recognizing sportsmanship. The 32 player nominees for the third annual Art Rooney Sportsmanship Award have been finalized, the NFL announced Tuesday. Each NFL team nominated one of its players for the award, which recognizes players around the league who exemplify outstanding sportsmanship on the field. The 2016 nominees for each team are listed below. FOXBORO - Sunday night marked the beginning of a new era for the Patriots' defensive unit - life without Jamie Collins. The trade of the veteran linebacker to the Cleveland Browns, who was third on the team with 43 tackles, had its first ramifications in the Patriots' 31-24 loss to the Seattle Seahawks at Gillette Stadium because the Patriots had been off since Halloween, on their bye week. No doubt, Collins' departure was going to result in changes in playing time and responsibilities up and down throughout the front seven. Among those seen as potential beneficiaries of the trade was defensive lineman Trey Flowers, who continues to have a solid first full season with the Patriots. "It's been good," said Flowers, who collected a pair of sacks to go with three tackles against the Seahawks. "I feel like I'm ready for the second half of the season, no dings or anything like that. So away we go." Flowers spent all of last season on injures reserve, so technically, he's a second-year player. So far this year, he has 18 tackles and two sacks (one more than Collins had) as well as a pass defense and a fumble recovery. Flowers, who got the start Sunday night at right defensive end, had five tackles and both of his sacks in the Patriots' 41-25 win at Buffalo just before the break. 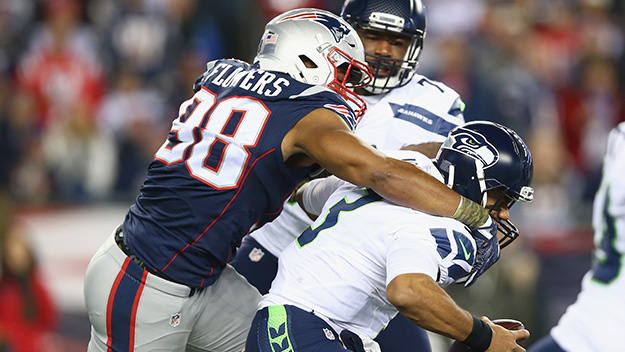 He got a 7-yard sack of Seattle's Russell Wilson in the first quarter and another sack in the third quarter. "Yeah, that's just the maxim of continuing to get better," he said. "It's just to continue to grow on my pass rush, stopping the run, whatever they want me to do and being productive in those areas." Flowers had been on the field for 238 defensive snaps, or 42.9 percent of the available snaps, entering the game against Seattle. By contrast, Rob Ninkovich (who served a four-game suspension) has played in 34.1 percent, Jabaal Sheard 69.7 percent and Chris Long 70.3 percent. Flowers said he wasn't sure if Collins' departure would impact those numbers, but he said he was ready for whatever might come his way. "I don't know which way they're going to go with that," he said. "I just know it's my job to be ready whichever way they go. If they choose me to increase my role, just to be ready for it. If my role stays the same I'm going to work with what I've got. My main job is to stay ready for any time and any position they want me to play." Detroit Lions quarterback Matthew Stafford walked through the door without a limp. He could breathe with no apparent pain in his ribs or chest. He didn’t wince. Didn’t gasp for air. There were no bandages on his hands and no reports of postgame X-rays, which was truly remarkable considering he had just reached the halfway point in the season. Stafford smiled and looked relatively healthy, standing at the podium Sunday afternoon after an overtime victory over the Minnesota Vikings. If you want to know why the Lions have won three of their past four games, it starts right there — with Stafford’s health. It starts with the protection he is getting from the offensive line. Because Stafford can’t pull off any miracle comebacks when he’s beat up and on his back after getting sacked. In the first five games of the season, Stafford was sacked 14 times. He has been sacked six times in the past four, and the Lions have won three. Let’s get a quick history lesson. A year ago, Stafford was beat up unmercifully in both games against the Vikings. After the first game, Stafford needed X-rays on his ribs and chest, and he barely could breathe. In the second game, Stafford was hit 13 times, sacked seven times and needed X-rays on his left hand. I remember watching the offensive line and thinking: They look so confused, like they have no idea whom to block. The next day, the Lions fired offensive coordinator Joe Lombardi and Jim Bob Cooter took over, a change widely praised and dissected — in Cooter we trust! But something else significant happened, which has gone largely unnoticed. On the day Cooter took over the offense, Caldwell also fired offensive line coaches Jeremiah Washburn and Terry Heffernan. Ron Prince, who had been coaching the tight ends, took over the offensive line. Prince was an assistant offensive line coach with the Jacksonville Jaguars (2012) and Indianapolis Colts (2010-11). Last January, Caldwell made another move that seems to have paid off, hiring Michael McCarthy as a new quality control/offensive line coach. When Pro Football Focus graded the Lions’ offensive players after Sunday’s game, four of the top-six grades were given to the Lions’ offensive linemen: left tackle Taylor Decker (83.4), left guard Graham Glasgow (73.6), right tackle Corey Robinson (73.6) and right guard Larry Warford (71.5). Only Golden Tate (85.0) and Stafford (79.1) also cracked the top six, although I think they give extra points for the backflip. And a lot of the credit has to go to Prince and McCarthy. There is plenty of room to improve for the offensive line. The Lions are averaging a measly 86.8 yards per game on the ground, fourth worst in the NFL. But the Lions are trying to cover up a bad running game with Stafford’s arm and a strong kicking game. Everything, as always, hinges on Stafford. In the four losses, Stafford has completed 63.3% of his passes for five touchdowns and four interceptions. In the five wins, Stafford has completed 71.2% of his passes for 13 TDs and one pick. All in all, Stafford is a pretty good quarterback when he isn’t on his back. 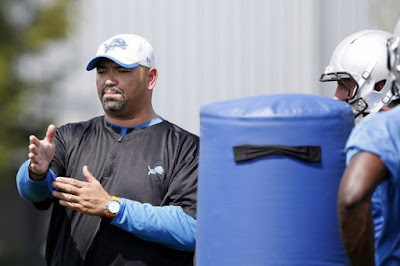 So, as you praise Cooter and Stafford, don’t forget about Prince and the offensive line, which still is incredibly young and far from perfect, but it is jelling and continues to improve. You could see the proof on Stafford’s face Sunday. The way he looked pain-free after playing the Vikings.